Alan Baxter is a man who practises what he preaches. He is the author of two dark fantasy novels, RealmShift and MageSign, a stack of short stories, and reams of non-fiction. Yet he hasn’t rested on his laurels. Alan continues to learn and grow as a writer, and to help others do the same: based on the great succes of the writing workshops he has run at conventions, he has recently published Write the Fight Right, a guide designed to help authors craft engaging fight scenes in their fiction. The secret to good writing, says Alan, is to never stop learning. I’m regularly drawing parallels between the world of martial arts and that of writing. The comparisons are legion. One of the most relevant is the time it takes to become a martial artist of any skill and a writer of any skill. I’ve been a martial artist for 30 years, a professional to some degree or other for 20 of those. And I’m still learning. Writing and martial arts are the same in that you never finish – you never stop learning, improving, discovering, refining. If you think you’re done, you’ve stalled, not finished. So many people come to martial arts classes and expect to be Bruce Lee in a few weeks. Then they realise how much work is involved – how much bloody hard work – and some give it up while others knuckle down. Then, after a year or two, when their skills are greatly improved, there are those who think they’re top banana and are full of ego, and those who realise how much further they have to go. It’s the latter who go on to become accomplished martial artists. Every time. Same with writers and writing. Alan Baxter is a British-Australian author living on the south coast of NSW, Australia. He writes dark fantasy, sci fi and horror, rides a motorcycle and loves his dog. He also teaches Kung Fu. 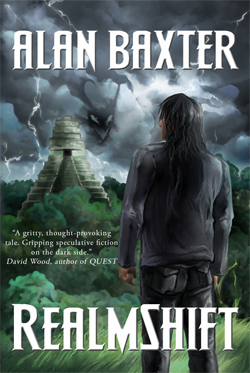 His contemporary dark fantasy novels, RealmShift and MageSign, are out through Gryphonwood Press, and his short fiction has appeared in a variety of journals and anthologies in Australia, the US and the UK, including the Year’s Best Australian Fantasy & Horror. Alan is also a freelance writer, penning reviews, feature articles and opinion. Read extracts from his novels, a novella and short stories at his website and feel free to tell him what you think. About anything. Tags: alan baxter, magesign, realmshift, tuesday therapy, warrior scribe, write the fight right, writing advice. Bookmark the permalink.